Need Chain Link Fence Repair in Atlanta, GA? Luckily, chain link fences can be repaired with new parts, and Fence Workshop has the most knowledgable repairmen on the job. Compared to wood fencing which will typically last up to 22-years and still need to be repaired along the way, good chain link fencing can easily last up to 5x as long and need the same or less repair work than wood fences. We receive a high volume of Atlanta, GA fence repair calls, so we want to make getting you a quote as quick and simple as possible. Whether you have a residential or commercial chain link repair, we can get you a quote via e-mail when you provide pictures and general information about your repair. This eliminates the extra time required to come out and visit a property on two separate occasions, making our repair prices more affordable for the customer. Send your chain link repair photos to info@fenceworkshop.com and we’ll get a quote over to you in no time. 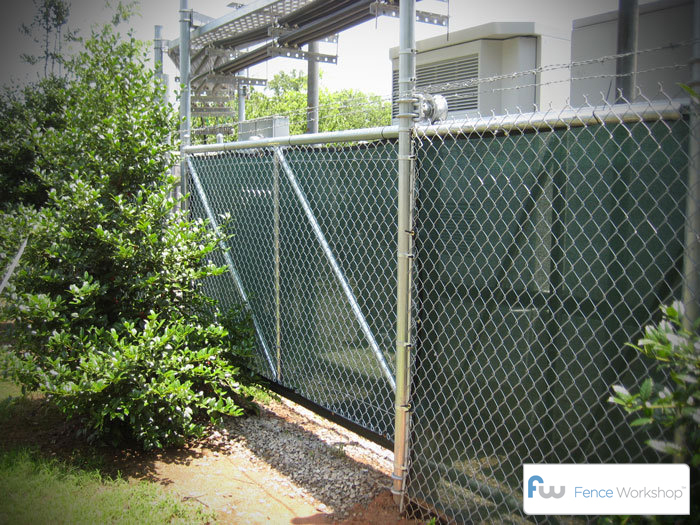 At Fence Workshop™, we professionally repair both residential and commercial chain link fences in Atlanta. Whether you have a regular 4 foot galvanized chain link fence or a 10 foot green, brown or black vinyl coated chain link fence, we should have all the products needed to repair your fence, in-stock. Typically we can repair all styles of chain link fence in Atlanta, within days. So if you’re looking for the right fence company, contractor, builder or installer to repair chain link fencing in Atlanta Georgia, Fence Workshop™ is the go to fence company. Get Your Repair Quote Now! We know you need to get your Atlanta, GA fence repaired quickly, and we would love to help. You’re just a call or click away from getting started! Use the e-mail below to provide photos of your damaged fence and include any information that will be helpful for an accurate estimate such as measurements. Whether it’s a residential wood privacy fence, a commercial chain link gate or anything in between, we can get a quote over to you in no time.